Thanksgiving Day is not only 3 F’s – Food, Family & Fun, it is also about having great time. How about throwing a Thanksgiving Costume Party for your friends and family or going for the traditional Macy’s Thanksgiving Parade with your whole family dressed as Native American or Thanksgiving Turkey or Pilgrim to celebrate the Fall Festival of warmth – Thanksgiving Day. May people are of the perception that who wears Costumes on Thanksgiving Day, it’s about sitting around the Dining table and having Dinner with family. Do something different this Thanksgiving Day by having a Costume Theme Thanksgiving Party to travel back to history and thank Lord and your ancestors for every blessing they have showered on you. There are huge varieties of Kids & Adults Thanksgiving options available. Thanksgiving Day is time when families come together to celebrate. Don’t let your children be left alone this Thanksgiving Day. Dress them up in Pilgrim Costumes, Native American Costumes or Colonial Costumes to let have enjoy the Holiday. It’s fun to let your Kid act as Turkey in this Turkey Child Costume and enjoy the warmth of Thanksgiving Day. This costume includes body section with attached foot covers and hood. Does not include shirt. This cute little Turkey Costume is a Visual Treat! 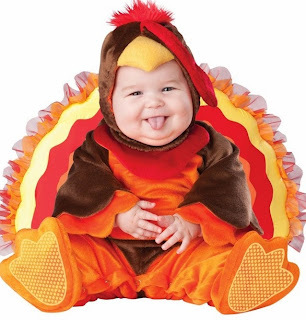 Make your little one’s first Thanksgiving Dinner special and memorable in this Infant/Toddler Little Gobbler Costume. This Costume includes jumpsuit, hood, and detachable feathers. Let your little Girl Portray this Biblical Mary Character this Thanksgiving Day Costume. This Mary Child Costume includes headpiece, robe, and belt. Does not include shoes. Let your little boy be a part of History in this Moses Child Costume. Let him dress up as Moses who parted the Red Seas in this Moses Child Costume. This Costume includes robe, under robe, and belt. Does not include wig, beard, shoes, or script. Teach you little boy importance of Harvest in this Traditional Pilgrim Boy Costume. This Pilgrim Boy Costume includes a black cotton hat with white strip and gold square accent, black cotton shirt with white lapels and white folded sleeve cuffs, black cotton pants with elastic that cinches just below the knee and a black belt with gold clasp. Gold shoe buckles and white nylons sold separately. Shoes not included. 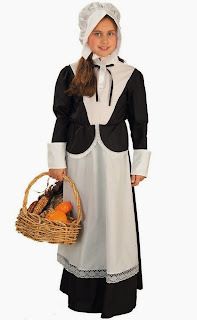 Celebrate harvest season in this Pilgrim Girl Child Costume this Thanksgiving Day. This costume includes a white cotton bonnet with an under-the-chin ribbon tie, a long, black cotton dress with a cinched waist and an attached apron. Basket and vegetables not included. You daughter will add charm to the Thanksgiving Party in this Little Indian Princess /Child Costume. Everyone will bow in front of this adorable Little Indian Princess. This costume includes dress, headband, and boot covers. Does not include flowers or boots. 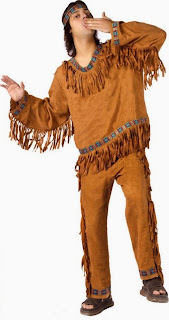 Dress up your little Boy as brave Native American Indian. This costume includes top, pants, and headband. Does not include weapon, face paint, or boots. Who said Thanksgiving Costume is only for Kids! Even Adults can enjoy the Thanksgiving Fun with Thanksgiving costumes available for adults. Adult Thanksgiving Costumes are available in Turkey, Pilgrim and many other styles. 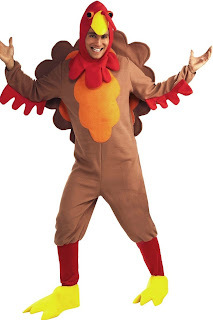 Get everyone laughing in this Johnny-o-Turkey Adult Costume. This costume includes Headpiece, Jumpsuit, Shoe Covers. Dress up as the Brave warrior in this Indian Princess Adult Costume. This Costume includes Faux suede underwire corset, skirt and head piece. Boots not included. Want to experience the tribal prestige – dress up in this Native American Adult Costume to feel the Tribal Prestige. This Costume includes top, pants and headband. Does not include sandles. Show off your cultural side in this Native American Princess Adult Costume. This costume includes headband, dress, and belt. Does not include hammer or boots. Material: 100% Polyester Exclusive of Decoration. Pick up one of your favorite Thanksgiving Day Costume to add that extra fun and charm this Holiday Season.